The UltraFire WF 502B is an impressive, affordable flashlight offering up to 1,000 lumen output, provided you are able to find the genuine product. There are many fake UltraFire products being sold and they are also coming from China so the company has been very aggressive in protecting its brand and advising customers accordingly. The flashlight has a smooth finish and modern aesthetics. The beam is impressive although the light flood is a little too spread out. It comes with 5 modes and can be bought as a kit with a rechargeable battery and other accessories like the tactical mount and charger. For a handy battery, you will enjoy using it, its strong beam, and the 5 modes. Definitely, good value for your money. 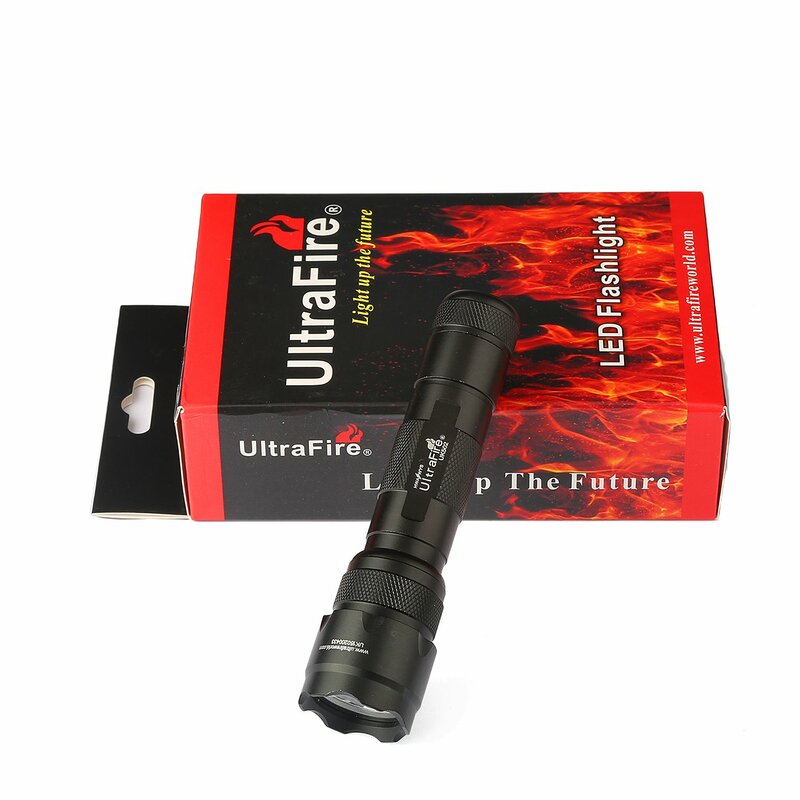 The UltraFire line of flashlights is a product of Wha Fat Technological Company, Limited. This company was founded in 1995 in Hong Kong and enjoys annual revenues of US$1 million. Their products are sold in more than 15 countries although has a current problem of copycats from China that includes the WF502B flashlight. The WF502B flashlight is just like all UltraFire illumination tools: reliable, handy, rugged, and very compact. It is being sold as the compact flashlight from Ultra Light with 1000 Lumens from an upgraded CREE XML T6 LED bulb. This aluminum -cased flashlight is weatherproof and comes with Lens O-ring and Tail Cap seals. You can buy just the flashlight or the kit which comes with a battery pack and charger. You can also switch modes with a half click on the flashlight’s tail switch and full clicks serving as the power button. The flashlight has a mode memory so even after you switch it off, it will remember the last mode used once you switch it back on. The WF502B 5 modes are SOS, Strobe, 40 lumen, 400 lumen, and the brightest at 1000 lumen. The strobe mode is slower than usual which is perfect for those who tend to get irritated by a quick frequency. If you buy the flashlight, it will not include the battery pack and the manufacturer is clear that while the flashlight only needs one battery, it has to be the specific 3.7 volt, 18650 Lithium batteries. Any other battery will cause the flashlight to malfunction and possibly burn the bulb. The battery is not easy to replace. You might have to order it online since most hardware stores do not stock up on this particular battery size. The advantage of using this battery is the long life. It can run continuously for several hours at top mode or for over a week of interrupted use. It has been described as being brighter than the headlights of a car and has been used as a bike light for bikers who go out at night. The problem though is that it can be blinding and even illegal to use this type of light for bicycles. Compared to a 160 lumen torch, the UltraFire WF502B flashlight is double the light intensity however, the beam has a wider span or flood which is disconcerting for those who prefer a stronger focus. The throw of the flashlight is about 200 yards. On the downside, the flashlight will get uncomfortable to handle after burning for over 30 minutes on high. Also, the switch for the modes and the power is in the same place so a slight jiggle of the tail cap can switch modes or shut down the flashlight. For the retail price, this flashlight is a great buy for home, emergencies, and as part of your car’s repair kit. This product by UltraFire is a good buy but you have to make sure to buy the authentic product. The copycats tend to fail even at first use. The claim that the output can reach up to 1000 lumen is questionable nonetheless, it is very bright and great for pitch dark emergencies. Many previous customers have complained of an overheating problem because using it for over several minutes can turn the aluminum alloy casing too warm for comfort. Still, for the price, it is a good buy.